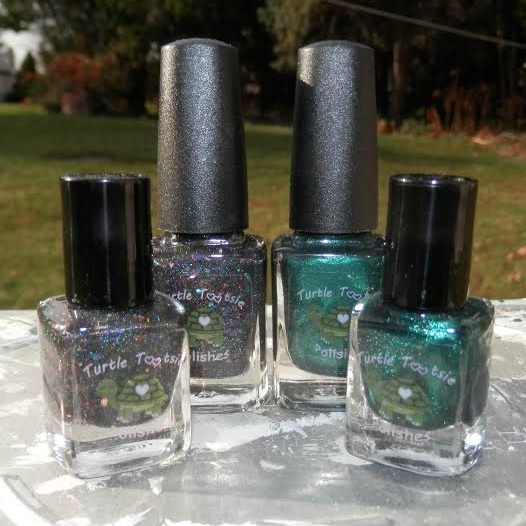 Bright and early this morning, I'd like to introduce Chrissy and her brand, Turtle Tootsie Polish! Now, I've worked with Chrissy a few weeks ago and she was makes GORGEOUS polishes---you can find that review HERE. Plus she's such a lovely lady and such a pleasure to work with that it only makes sense that we feature her in this week's series, right?! So here we are! For this week's giveaway, TWO very lucky winners will win her exclusive Black Friday duo, pictured below! Plus, if you follow us on Instagram (HERE and HERE) you have ANOTHER chance to win! THREE winners total! Good luck, my darlings! I'm actually wearing her Cotton Candy scented top coat today and it smells so good!